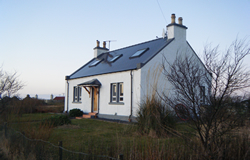 Situated in the township of Stilligarry on the beautiful island of South Uist, Benview is a lovely newly renovated traditional stonebuilt crofter’s cottage. Sitting on the Loch Drudibeg Nature Reserve it is a haven for birdwatchers and nature lovers not to mention anglers and hillwalkers. As the name suggests Benview offers stunning views of the South Uist hills and the beautiful sandy beach and new machair walkway are only 1 mile away down the quiet township road. The spacious ground floor comprises an open plan kitchen dining area with double doors leading to a patio and enclosed garden. The kitchen is fully fitted with electric oven and hob, fridge freezer, dishwasher, microwave and washing machine. Also downstairs there is a bathroom with separate shower and heated towel rail, a double bedroom and 2 living areas. The living room at the front of the cottage features a working open fireplace and a flatscreen TV with video and DVD. The second living area at the back of the cottage also has an open fire a stereo music system and also a double sofa bed. Upstairs consists of 2 large bedrooms each with a double and single bed so that they may be used as double or twin rooms or may suit a couple with a young child. The landing has a walk-in wardrobe for each room and a quiet sitting area with TV with built in DVD player.